This is a foundation level manual in the popular series from the BSAVA. It presents the basic principles upon which the practice of modern veterinary surgery is based. The principles of surgery will often dictate the outcome of a surgical procedure, more so than the use of the most up-to-date technique, and the surgeon ignores them at their peril. 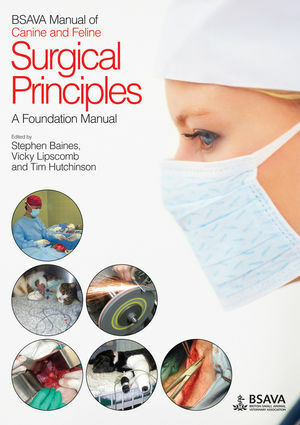 The BSAVA Manual of Surgical Principles presents a solid grounding in the basic principles, with practical examples of why they are important, creating a manual that is very readable and relevant for the veterinary surgeon in practice. Stephen qualified from Cambridge University in 1990. He held an internship at North Carolina State University and then spent a year in general practice before taking up a residency in small animal surgery at the University of Liverpool. In 2000 he completed a PhD in canine tumour biology at Cambridge, where he remained as a lecturer. In 2004 he moved to the Royal Veterinary College, becoming a senior lecturer and head of surgery. Stephen moved to his current position at the Willows Veterinary Centre in 2011. Stephen is interested in clinical oncology, wound management and reconstructive surgery, and minimally invasive surgery. Vicky graduated from Cambridge University in 1996 and has spent time in both general and referral practice. Vicky completed her specialist surgical training at the Royal Veterinary College in 2001, gaining the European Diploma in Small Animal Surgery in 2002. Vicky returned to the RVC as a lecturer in 2003, becoming a senior lecturer and head of soft tissue surgery in 2011. Vicky is interested in all aspects of soft tissue surgery, enjoys teaching and lecturing on soft tissue surgery topics, and has a particular interest in clinical research of congenital portosystemic shunts. Tim graduated from the University of Liverpool in 1994 and has worked in private practice ever since. Tim gained his certificate in soft tissue surgery in 2002. Since 1998 Tim has worked at Larkmead Veterinary Group in South Oxfordshire, a member of XLVets - a group of independent practices, with a nationwide footprint, cooperating to provide ‘Excellence in Practice'. Tim currently divides his time between referral surgical work and a managing partner role.